The danger is in the unseen: Fine dust is a threat to people. Specifically, ultra-fine dust particles constitute a health threat. This finding is becoming more accepted in science and practice and can be applied directly to welding or rather welding fumes. The use of extraction units and filter systems helps metal workers, but do we still need to look at the hazards differently? Quickly checked the current fine dust value and the daily forecast about its development via mobile app in the morning; made a decision for or against respiratory protection and off to work. Simply ask the inhabitants of mega cities in China or India why they bother to take such precautions? 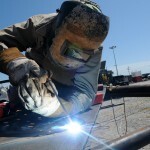 But what does their every day life have to do with your work as welder? Quite a lot actually. Ultra-fine particles, and hence fine dust, also occur during welding. The vast majority of welding fumes particles is ultra-fine. 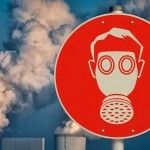 The health risk for the welder is significant if no effective air purification concept has been implemented. Whilst fine dust outside is mostly created by car or truck traffic – the Max-Planck-Institute for Chemistry in Mainz attributes around 7000 deaths in Germany to this fact per year – and dangerous concentrations can occur outdoors as well, the welder finds himself in an enclosed space where air cannot simply escape. Welders in companies without air purification technology report welding fumes ceilings 4 metres above their heads. Whilst the fine dust outdoors is mostly invisible, the hazard behind the particles becomes obvious in welding operations – and the cloud consists of millions of ultra-fine particles. The difference between welding and hazards outside. 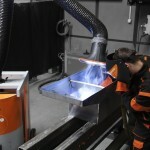 Welders without extraction system and filter technology inhale contaminated air directly at the point of origin. 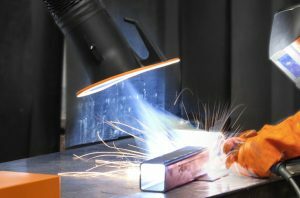 Welders are often exposed to far more hazardous particles than those occurring in traffic due to the materials and consumables – from aluminium oxide to chromates. And back to the general numbers: The Max-Planck-Institute for Chemistry estimates that 3.3 million people die every year worldwide, 35,000 in Germany, due to the effects of fine dust. By 2050, this number may rise to up to 6.6 millions. The world health organisation classes fine dust as a direct cause of lung cancer. 1,400 billion Euro of economic damage is caused by the effects of air pollution e.g. due to sickness costs and work absences every year. Have you projected this for your business? The fight for the best employees may be decided by work health and safety when recruiting and retaining qualified staff. Foreign workers mainly leave the business location due to bad air, states the European Chamber of Commerce in China. Against this backdrop, businesses will have to take a closer look in future. Associations are attempting to also develop limit values for ultra-fine particles, however, these are still hard to measure. The limit value for alveolar hazardous substances e.g. has been lowered in Germany most recently. Yet, the even smaller ultra-fine particles – at a size of a maximum of 0.1 µm, they are 1000 times smaller than a hair – have not yet been included in such considerations whilst technology makes measurements possible. At the moment highly sensitive measuring devices are being established in the practice; these are able to measure fine dust concentrations precisely to the smallest particle. And this will become the discussion of the future: Do we need a limit value which measures according to weight? Or do we have to start counting honestly? Since even the smallest particle which may only contribute minimally to the weight can already have a damaging effect. Workplace limit values are currently based on weight. For example, in Germany this value has to be less than 1.25 mg/m³ for a business to operate within the legal limit. Yet, what does this limit value actually mean: 1.25 mg of heavy particles per cubic metre can just as much consist of a few large or of millions of ultra-fine particles, which in turn are far more dangerous. Companies take a safe approach by installing effective and state-of-the-art filter systems. These already clean the air from a large part of ultra-fine dust particles.